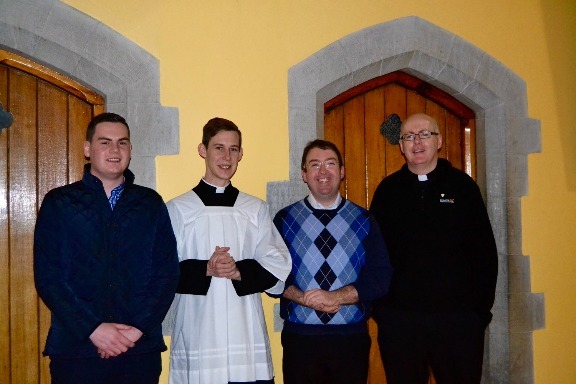 armaghpriest - Our New Lector! There was great joy in our diocesan community last evening when our second year seminarian, Mr. Stephen Wilson, was instituted into the ministry of reader. 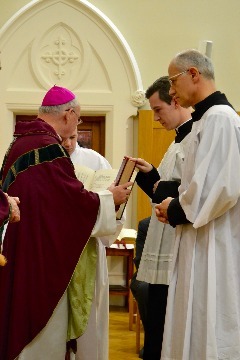 Along with five brothers seminarians, Stephen was instituted by Bishop Raymond Field (auxiliary bishop of Dublin) at the National Seminary of Ireland, Maynooth. "The reader is appointed for a function proper to him, that of reading the word of God in the liturgical assembly. Accordingly, he is to proclaim the readings from sacred Scripture, except for the gospel in the Mass and other sacred celebrations; he is to recite the psalm between the readings when there is no psalmist; he is to present the intentions for the general intercessions in the absence of a deacon or cantor; he is to direct the singing and the participation by the faithful; he is to instruct the faithful for the worthy reception of the sacraments. He may also, insofar as may be necessary, take care of preparing other faithful who are appointed on a temporary basis to read the Scriptures in liturgical celebrations. That he may more fittingly and perfectly fulfill these functions, he is to meditate assiduously on sacred Scripture. Aware of the office he has undertaken, the reader is to make every effort and employ suitable means to acquire that increasingly warm and living love and knowledge of Scripture that will make him a more perfect disciple of the Lord." Photographs are courtesy of Mr. Aidan Gallagher.